Homage, the brand of R&I Electrical Appliances (Pvt.) Ltd., now introduces new range of Hexa Series Invertors in Pakistan. Invertors are used as UPS in Pakistan, however their is a difference between invertor and UPS. Homage Hexa Series are not type of Solar Hybrid Inverters they are semi hybrid as the company is claiming through their TVC that they can only charge the battery through Solar Energy. R&I introduced these products on April 6, 2016. 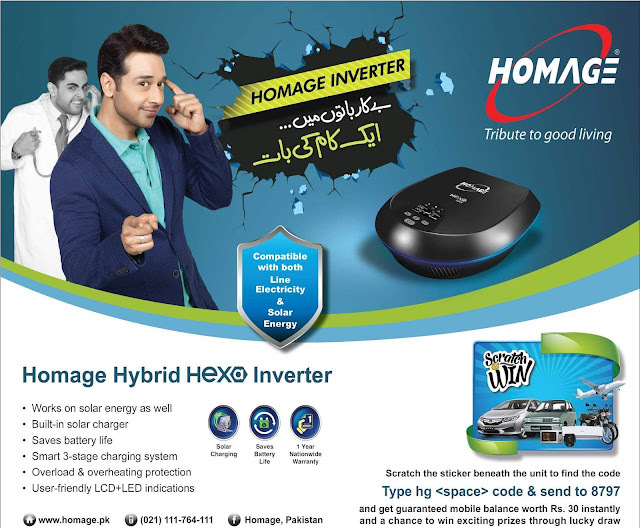 This time the company is claiming that their inverters have built-in solar charge controller which will charge the battery through solar energy, instead of Wapda in the presence of sun, in evening Wapda energy will be used to charge the battery. In this way you can save electricity only in sunny hours or in presence of sun, in cloudy weather Wapda will charge the battery. Homage also introduces ATS generators in Pakistan from 1-KV to 6KV.